If you’ve ever stared up at the night sky, wondering how it all works, you are among millions across mankind’s history who have been inspired to learn more. But many are put off because they assume the science that makes the stars move across the heavens and powers the rockets we send out beyond the Earth is too complex for them ever to understand. Writer and space enthusiast JD Palmer is on a mission to demystify the secrets of space science. He believes that astronautics, Special Relativity and other theories that explain the universe are built on core ideas that anyone can understand with a bit of dedication – and the help of someone to lead them through the basic maths in easy steps. 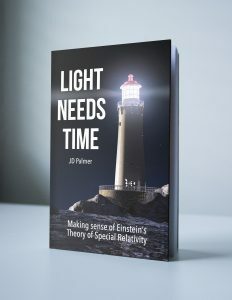 His first book, Light Needs Time, explains how Einstein’s Special Theory of Relativity affects the very fabric of the universe we live in. 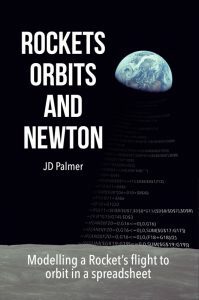 His new title, Rockets, Orbits and Newton, is the first of a series of three that will demonstrate the mathematics behind space flight. Packed with charts, diagrams and examples, these books make the complex understandable and take Special Relativity and rocket science out of the lecture theatre and into your home. Download FREE spreadsheets with key equations from each book and try out the science for yourself! A really excellent book on a fascinating topic. This book takes the reader through an easy to understand, but very enjoyable journey into Einstein’s Special Theory of Relativity. There are some brilliant diagrams and illustrations that help the reader to make sense of what could otherwise be a confusing subject. Highly recommended for anyone who would like to understand more about Relativity. …can you guide a Rocket into orbit? Fortunately, Sir Isaac Newton prepared the way for us hundreds of years ago in his laws of motion and law of gravity. 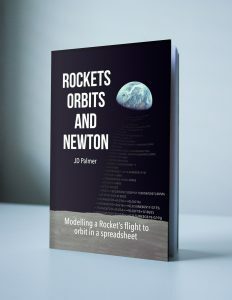 Using only Newton’s four laws and some basic mathematics this book demonstrates that the flight of a Rocket to orbit can be realistically modelled in a simple spreadsheet. Use the calculations from Rockets Orbits and Newton to model your own space missions. See a mathematical model of the successive stages of a Rocket’s flight to orbit. Modelling elliptical orbits where height and speed are constantly changing. …this is the book for you! The theory gives us a much richer and deeper perspective on reality than the one our senses provide us with – but don’t let yourself be put off by its daunting reputation. You really don’t need to be a genius like Albert Einstein to understand and marvel at the symmetry and beauty of his work. 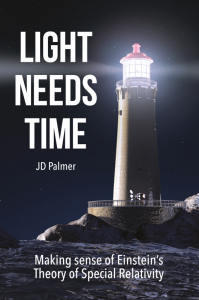 Packed with more than 100 diagrams and charts, Light Needs Time guides you step-by-step through a detailed investigation into Einstein’s Special Theory of Relativity. A spreadsheet containing the charts and calculations used in 'Light Needs Time'. Observers who are moving relative to each other perceive reality differently. Two observers disagree about the distance a light pulse travels at the constant speed of light. Watch the maths that powers rocket flight and relativity unfold in front of your eyes with these slide shows. Each slide show relates to a topic covered in the author's books on relativity and spaceflight, demonstrating how variations in the values of key equations produce visible real-world effects. I had been curious about Einstein’s Special Theory of Relativity since my schooldays, so when I retired from a career in computing I decided to have a go at working out for myself from first principles what was going on. But I didn’t just want to understand relativity. Like most of my generation, I had watched enthralled as the first manned mission landed on the Moon. I found myself inspired by the idea that an object blasted so dramatically into space could then coast effortlessly around the Earth forever. And so, as I worked to understand Einstein, I also set out to chart the science that led to Neil Armstrong’s one giant leap. Doing all this involved a great deal of careful thought and perseverance, and in the process I generated detailed sets of notes and diagrams. That’s how these books came about: a way of making this material available to other people who share my curiosity and excitement about our universe, in the hope it will help them understand how reality works.